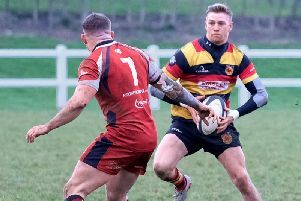 Harrogate RUFC are now potentially just one win away from claiming the North Premier's one promotion play-off spot following a more-than-comfortable home win over Kendal. Dave Doherty's side cruised to a 38-0 victory at the Stratstone Stadium, their bonus-point success leaving them within touching distance of second-placed Billingham with just seven fixtures remaining in 2018/19. Defeats to their aforementioned rivals from County Durham and then in-form Wirral either side of the Christmas break looked to have ended the Aces' hopes of a return to National Two, yet three consecutive wins have re-ignited their challenge. The third of those triumphs arrived on Saturday as struggling Kendal were put to the sword in a match that 'Gate dominated for all but about 10 minutes. They could and probably should have breached the Cumbrians' line twice before they eventually did in after a quarter of an hour, a number of promising attacking positions going begging during the early exchanges. Undeterred, the hosts progressed from inside their own half, gaining good yardage before Andrew Lawson burst down the left flank, drew the final Kendal defender then passed the ball inside for Oli Rosillo to dot down under the posts. Nathan Wyman booted over the extras for a 7-0 lead. The visitors did eventually manage to get hold of the ball and apply some pressure of their own, but they were let down by poor handling on more than one occasion. With a strong wind blowing across the field, errors then began to creep into the 'Gate game, however the home team found another gear as half-time approached. Sam Fox weaved his way between a couple of defenders and offloaded to Harry Barnard who was stopped three yards out, though a penalty was forthcoming. Having opted for a scrum, 'Gate then showed both patience and composure in the red zone, their forwards burrowing away until big lock Sam Brady eventually made it over the whitewash in the 40th minute, Wyman again converting. The second period began the way the first had ended with Doherty's men continuing to ask plenty of questions of their visitors. 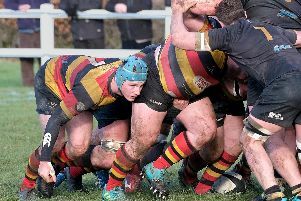 Kendal managed a turnover inside their own 22, but not for the first time they were shunted backwards at a scrum, sparking chaos in the away ranks. Two visiting players tried and failed to gather the loose ball before Harrogate skipper Danny Matthews was rewarded for his tenacity, kicking ahead and over the try-line then winning the race to touch down. Another routine two-pointer for Wyman stretched the gap to 21-0. More of the same was to follow when a penalty was kicked to the corner and 'Gate's trusted catch-and-drive routine saw the home pack rumble over for impressive number eight Jonny Coser to apply a finishing touch. Out of nowhere, Kendal then came to life and a 10-minute spell saw them go through phase after phase as they hammered away at the home line. Their efforts were however to prove in vain as the Harrogate defence remained impressively resolute, slamming the door in the Cumbrians' faces time after time. Normal service was soon to be resumed. The hosts pushed the visiting forwards off their own ball once more at a scrum and although Coser couldn't quite make it over, Andy Boyde was on hand to add try number five, converted by replacement Cail Cookland. The scoring was then rounded off at 38-0 when Matthews gathered a Kendal chip over the top and set Barnard away down the right. The latter was brought to ground just short, as was the supporting Lawson, however Brady arrived quickly and dived in for his second of the afternoon, sealing an excellent day's work in the process. Next up for 'Gate is a trip to 10th-placed Kirkby Lonsdale on Saturday.